Pet Portraits. This is Mandy. This is a portrait of a great dog we had named Mandy. Mandy came to us as a gift from some dear friends – the Delamarian’s. She was the cutest wooly ball of golden fluff with bright eyes and an affectionate nature. Mandy loved water. She would plop down in any puddle. When drinking water she would encircle the water bowl with her oversized paws and dunk her head in – no reservations. For years Mandy, a full-sized golden retriever, did not realize that she could get over the rather low fence cut from a great redwood log that surrounded our huge Victorian home. 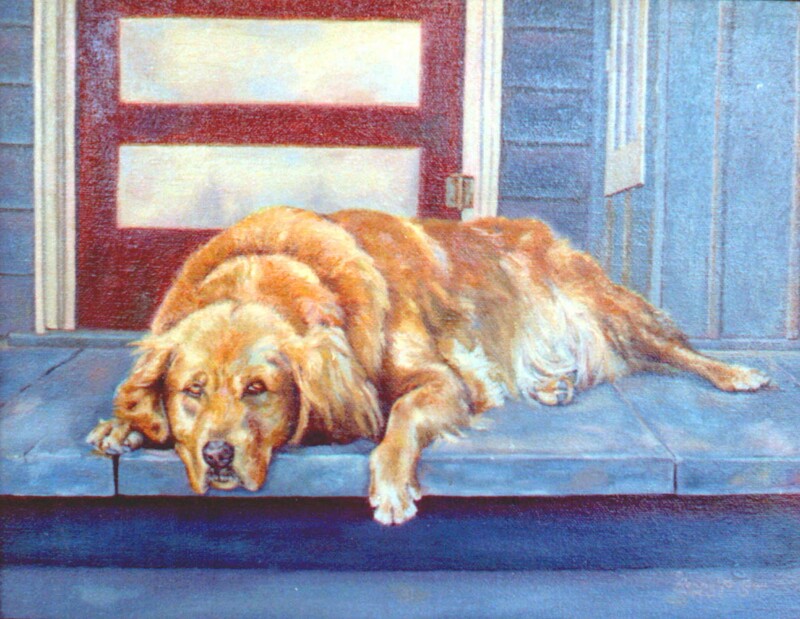 She obediently stayed within the yard and loved most of all, like all golden’s do, to be close to her masters. Then one day she spied a low-lying pine tree that was right next to the fence in our backyard. She figured out that it made a convenient step to hop over the fence and be in the great outdoors. fortunately we were surrounded by farmlands, and so it was a safe discovery. Then Mandy discovered something else. Gophers. She loved to hunt and chomped them down greedily. Crunch crunch, bones and all… yuck. Our animals got along fairly well. In addition to Mandy there was Stormy the cat and a couple of happy ducks…fenced in happy ducks. While we were gone one afternoon, Stormy gave birth to five new kittens on the kitchen porch. When we arrived Mandy come to greet us with something small and gray. She held it in her hunter’s mouth in an usually soft manner. At first we thought, gopher. When we realized it might be a kitten, our hearts sank. Mandy was a good hunter, and this might be bad. But somehow Mandy knew this kitten was different and she merely wanted to show us what was new at our house. She carefully returned the kitten back to her mother, with only a little extra slobber, for its journey in the jaws of the golden. Mandy like all pets had a unique personality. When she was alert, she was all energy. When she was tired, she was totally and fully relaxed (like in this portrait). She was a loyal friend, and we have great memories.